Sometimes you might need to prevent access to the website or whole hosting account for specific visitors, for instance, when you are developing a website or in case of DDoS attacks. For an automatic IP block, cPanel provides a special IP Blocker tool. NOTE 1: IP Deny Manager is available for all shared hosting plans starting from the Professional one. So if you have a Value plan with us, you should set denying rules in the .htaccess file manually. NOTE 2: Sometimes, it is easier to block all and allow access for certain IPs. Such rules are to be manually configured in the .htaccess file, as IP Deny Manager provides the possibility only to block IPs. NOTE 3: IP Deny Manager blocks access to all hosted domains and services under your account. 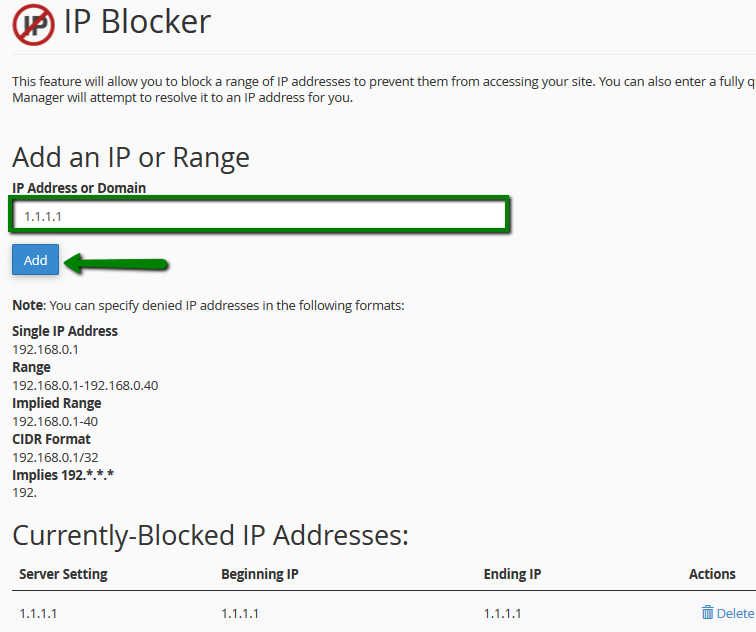 You can always unblock the IP by clicking Delete next to the IP address in question.